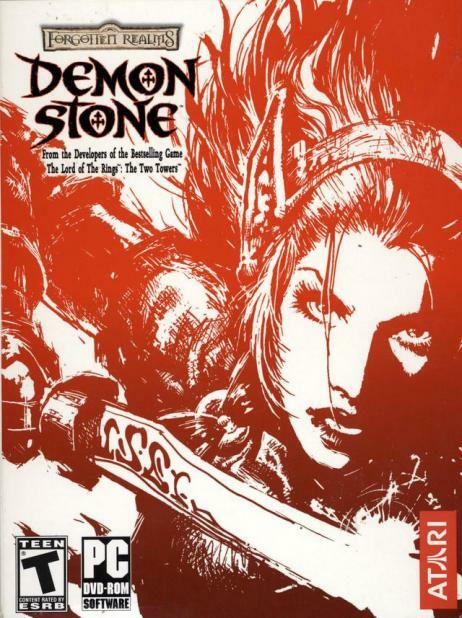 GB: When was development of Forgotten Realms: Demon Stone first begun, where do you currently stand in the development cycle, and What primary goals are you looking to achieve with this PS2 title? SFS: We started development in January of 2003, and we're currently finishing up the last set of levels for the game and getting ready to start tuning and squashing bugs. Our primary goal is to take D&D to a new level of gameplay experience that exploits the power of today's game consoles. We're heading away from the traditional dungeon crawl, and towards a cinematic action adventure with the unique gameplay twist of being able to play any of the party members at almost any time in the game. GB: Will the game be single-player only, or do you plan on offering cooperative or even online play? SFS: The jury is still out on that question! GB: Are you using an existing engine for FR: Demon Stone, or was it built exclusively for this new game? SFS: The engine is actually in its third generation on PS2 -- it's a revision of the engine we used for the Lord of the Rings: The Two Towers. We've made a whole bunch of improvements on the engine for this game, including the ability to have more characters on screen and richer-looking higher-polygon characters as well. We've also added special high-resolution heads on the characters to really bring the cinematic experience to life. GB: Can you give us a brief summary of the background and history within the game, and what the player will ultimately be looking to accomplish? SFS: At the beginning of the game, the party comes together, and inadvertently releases two evil forces that were imprisoned long ago by the wizard Khelben Blackstaff. The story is about their harrowing quest to re-trap those enemies. Of course, we worked closely with author RA Salvatore, and he has a couple of interesting twists and turns along the way. GB: Other than the primary storyline and objective, will there be side-quests that the player can partake of? If so, can you give us some examples of the side-quests players might be given? SFS: The game is focused on RA Salvatore's cinematic, roller-coaster ride of a story, so there aren't side quests in the traditional RPG sense.